With Halloween coming up, the scariest thing I can think of is making it out of the grocery and avoiding all the chocolate and treats calling my name (it is Candy after all!). How do I resist? I begin dreaming about one of my favorite chocolate fixes that won’t be mean to my insides like these high sugar and fat evil temptations. Bissinger’s Spa Chocolate knocks the socks off of your typical trick or treater type fare. It’s total sensory overload. As you lift that foiled lid off the assortment, woodsy cocoa aromas drift around you – saying consume consume! The feel of the chocolate is silkier than my pussycat’s coat – and that’s darn silky! It’s so soft I’m afraid it will evaporate before I can even pop it into my mouth. I think the only word that could adequately describe how decadent this stuff tastes is “Scrumpdillyumptious!” Thanks Mr. Wonka! Yummy Gummy Pandas - Too Cute to Eat? 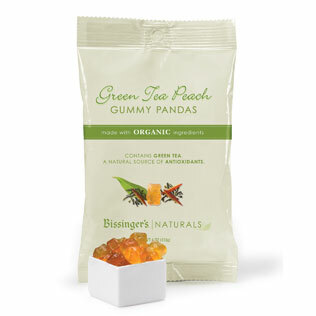 In addition to chocolate, another one of their popular spa treats is Green Tea Gummy Pandas, almost too cute to “bear”! Sorry, couldn’t resist. “Shed your guilt. Chocolate can have a place in your healthy lifestyle. Research studies show that some of the ingredients in our confections have potential health benefits for cardiovascular health, lowered risk of certain types of cancer and a slowing of the aging process. Nothing’s more gratifying. Treat yourself. Treat yourself well. I especially like the eat your veggies bit – like we’d just live off their candies – well, they are low in calories, carbs and have iron, maybe. . . . no I love my broccoli and spinach too much! Visit Bissinger’s to buy. Hi hunnie, sweet blog! I genuinely treasure this post.. I was curious about this for a long time now. This cleared a lot up for me! Do you have a rss feed that I can add?